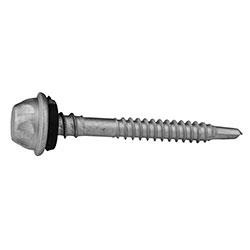 Kinmar permanent self-drilling one way screws feature a tamper-evident design and are used for securely fastening metal sheets, roofing, and cladding. Featuring our top-tier level three maximum security rating, Kinmar permanent self-drilling one way screws can only be driven with the matching socket and cannot be be turned anti-clockwise. There are no tools descigned to remove this screw, providing the ultimate level of fastening security. Positive engagement in matching installation socket. Quality AS3566 Class 3 coating. Available in 50mm & 25mm for metal roofing and cladding.